This Sunday night in Brooklyn, New York, World Wrestling Entertainment presents SummerSlam on WWE Network. It is arguably WWE’s second biggest show of the year after WrestleMania. Some people might say the Royal Rumble is bigger, but I think SummerSlam is number two. It’s going to be a long show, with the Kickoff show starting at 5 p.m. ET/4 p.m. CT and the main card beginning at 7 p.m. ET/6 p.m. CT. The expected run time of the whole evening will be at least six hours, though it might run seven hours. With 13 matches on the card, it’s going to be difficult to keep the Brooklyn crowd hot all night long. I think the Smackdown matches are a lot more interesting on this card. I care the most about Daniel Bryan vs. The Miz due to the excellent build that has taken place for that match. I’m also looking forward to AJ Styles vs. Samoa Joe for the WWE Title because of the possibility of a new champion. Even the Smackdown Women’s Title is compelling, due to issues that could pop up between Charlotte and Becky as challengers to Carmella’s title. The Raw side has some intriguing matches too, including the main event and whether or not Ronda Rousey can win WWE gold, but I think Smackdown is clearly the better show right now. Before I get to the card for the show, here’s a cool video featuring actor Terry Crews hyping up the event. That’s likely the full card, but an Elias “concert” is also advertised. That will likely mean he gets interrupted and beat up by Bobby Lashley. The only match above that I won’t address in my predictions is Balor vs. Corbin because I have no interest in it. I hope Balor wins and that ends the rivalry. Here are my ten predictions for the show. 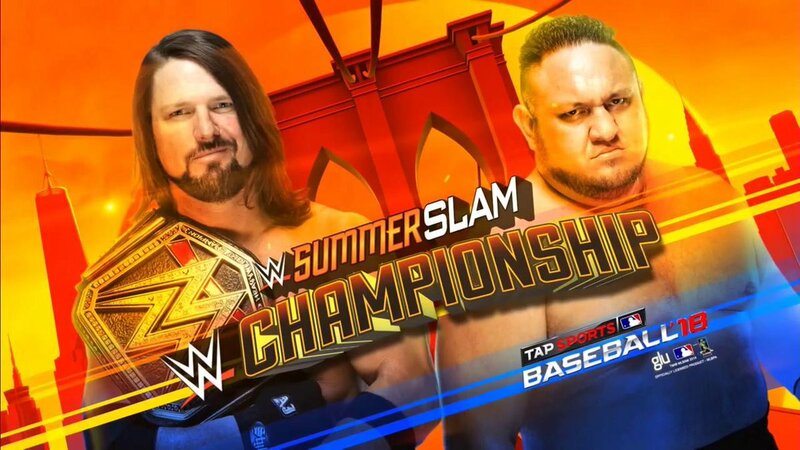 Sometimes I don’t care about the Kickoff Show matches, but I think the three matches at SummerSlam are worth checking out, whether you do it before the show or on demand after SummerSlam is over. The Cruiserweight Title match has been set for a few weeks with Drew Gulak stepping up as the challenger to the champion Cedric Alexander. I think Alexander should hold onto the title because he’s one of the most exciting guys in the division. Gulak is a good technical wrestler, but he’s not really known for his personality. Keep the title on Alexander for now until they find the right heel to take the title off him. I think Raw’s Tag Team division is poor, but I have enjoyed the push of The B Team duo of Bo Dallas and Curtis Axel, who are likely to be pushed as a face team since there are a lack of quality face tag teams on Raw. While I am also a fan of The Revival, this doesn’t seem like the right spot for a title change. Keep the titles on The B Team and have them drop the gold to the young Authors of Pain duo in the next month or two. The best of the Kickoff Show matches is Rusev and Lana taking on Almas and Vega. It should be on the main card, but I guess it doesn’t matter too much since it’s all on WWE Network anyway. The story is that Aiden English has accidentally cost Rusev and Lana matches in the past. I think this time, Rusev and Lana will get the win. That’s what makes sense in the storyline, perhaps with Lana pinning Vega to keep Almas looking strong. However, I think they’ll do something where English turns heel on Rusev and Lana on Smackdown next week to set up the Rusev feud with English. The Bludgeon Brothers duo of Harper and Rowan have held the SD Tag Team Titles for the past four months. They have dominated every team they have faced while not being tested that much, even when facing a great team like The Usos. This time they get The New Day, who earned this title shot after an awesome match against The Bar two weeks ago on Smackdown. It would be cool to see The New Day as champions again, but it just doesn’t feel like the right time. What I’d like to see is a storyline where The New Day fails here, they get another shot and fail again, so then a stipulation happens where if The New Day fails again, they must split up as a trio. That’s when they can win the titles to remain a group. That way, it would mean more for them to win because their backs would be against the wall. Perhaps that can happen at the Australia Super Show-Down event in early October. I hope it’s a competitive back and forth match that goes more than ten minutes, but most Bludgeon Brothers matches are shorter than that. It’s weird that there isn’t a Randy Orton vs. Jeff Hardy match on this show, considering Orton returned to Smackdown as a heel that has targeted Hardy over the last two months. Instead, Hardy is getting another shot at Shinsuke Nakamura for the US Title. It does make sense logically, since Orton cost Hardy the match the last time Hardy tried to win back his title. Anyway, I think the ending is obvious in this Nakamura/Hardy match: Orton, lurking in the shadows, shows up to cost Hardy the win. There’s no reason to put the title back on Hardy because Nakamura just won it from him recently. A scenario that would work could see Hardy looking he was ready for Orton to show up, but then he still falls victim to a Kinshasa knee strike from Nakamura. I’m looking forward to a proper Orton rivalry with Hardy. They had a memorable feud in WWE about ten years ago and they have chemistry together. As for Nakamura’s future, I don’t know who the next US Title challenger could be, but I hope Nakamura has a long reign as champion. I’m ready for Carmella’s title reign to be over, but when they added Charlotte to the match, it made it clear that the story will be Carmella finding a way to escape with the title again after she pins Lynch. That just feels like the obvious outcome. With that said, I think Charlotte Flair going to win the title from Carmella, possibly at the next PPV, Hell in a Cell, which would lead to a huge match at October’s Evolution PPV with Charlotte defending the title against her best friend Becky Lynch. The question then becomes this: will there be a heel turn by Charlotte or Becky because of what happens in this match? Maybe. I think it would be interesting to see Lynch as a heel because we haven’t seen her in that role on the main roster. Charlotte was better as a heel than she is as a face, but I think she’s fine either way at this point. There’s also no need to rush it. They can do the Charlotte vs. Lynch match Evolution in October with both women as faces and then go into Survivor Series as a team to set up the Four Horsewomen (Charlotte, Becky, Sasha Banks, and Bayley) vs. Four Horsewomen match against Ronda Rousey and friends. There are a lot of scenarios that could take place during and after the match. While I’m sure some fans will hate the thought of Carmella remaining as champion, that’s where I’m going with my prediction. It’s not a lock by any means. It’s just a gut feeling on my part. I am fine with WWE doing another Ziggler vs. Rollins match, but it’s weird how they are going from 30-minute Ironman match to a regular match. It feels like there should be some sort of stipulation here. The big news is that Dean Ambrose returned after nine months on the shelf due to surgery on his triceps, the first significant surgery of his career. When Ambrose returned on Raw, he was there to support his Shield brother Seth Rollins by taking care of Ziggler and his buddy Drew McIntyre. The match is Rollins with Ambrose vs. Ziggler with McIntyre, so in theory, it’s an even playing field. However, there are also some people that want to believe that Ambrose is going to turn heel. I say it’s a bit too soon. While I am all for heel Dean Ambrose, I think they should save it until 2019. Doing it now doesn’t lead to anything interesting. The next PPV is Hell in a Cell, which is not a big deal in the WWE calendar. There isn’t a PPV show for the men in October other than the Australia Super-Showdown event, which is also not a big deal. Survivor Series is a few weeks of pretending there’s a Raw vs. Smackdown rivalry. December is TLC, which matters less than any other PPV. Save the Ambrose turn for the Royal Rumble, which would then lead to Rollins vs. Ambrose at WrestleMania. You could even add Reigns to it to make it a Shield triple threat match. All I’m saying is save the heel turn for another time. I think Rollins will win the match thanks to Ambrose’s help. Perhaps McIntyre tries to interfere, Ambrose stops it from happening, and Rollins capitalizes with The Stomp on Ziggler to win the title back. I would love to see Rollins battling for the Universal Title instead of the IC Title, but for now, this is where he is. I hope by WrestleMania time, he’s in the Universal Title picture. How about Rollins vs. Reigns vs. a heel Ambrose at WrestleMania? That’s what I would do. 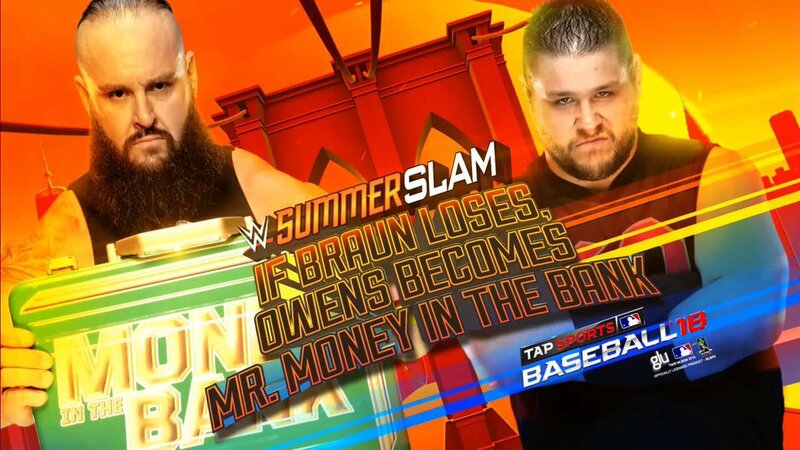 I think Braun Strowman should not only beat Kevin Owens to retain his Money in the Bank contract, but he should do it in short fashion. I’m talking five minutes. That’s nothing against Kevin Owens, because I like him and he’s one of my favorite guys in WWE, but I just feel like this is the show where people are going to remember Braun Strowman’s actions better than anything else on the card. Think about Strowman’s run on the main roster in the last two years. When they did the Superstar Shake-up two years ago, Strowman was put on the Raw brand. He wrestled as a heel for about a year, won nearly every match he was in, wrestled Roman Reigns about a half dozen times, and then turned face around SummerSlam last year. Since then, he has won nearly every match he’s had and they put him over huge with wins in the Greatest Royal Rumble earlier this year and Money in the Bank two months ago. You can say Strowman doesn’t “need” Money in the Bank all you want, but I think he has it for a reason and that’s to become Universal Champion at SummerSlam. In this match, Owens should get a bit of offense for a few minutes, maybe his pal Jinder Mahal tries to help, and Strowman absolutely destroys Owens. The last PPV, Extreme Rules, had Strowman lose the Steel Cage match by throwing Owens through a table. Strowman also lost by disqualification and countout to Mahal on Raw to tease the idea that he could lose the briefcase if that happens at SummerSlam. I say Strowman shows how dominant he is and he should easily beat Owens in this match. That’s not all I would do with Strowman either, but more on that later. Is it possible that Owens wins this match in cheap fashion and leaves SummerSlam as the Universal Champion? Sure, but it would feel like two years ago when Owens was already holding that title, wrestling guys like Roman Reigns and Seth Rollins. I’m all about the Strowman train now, and I think WWE needs to go all the way with him. I’m very excited about The Miz and Daniel Bryan at SummerSlam. It’s the match I care about the most. This past week on Smackdown, they aired three videos about the rivalry that ran about four minutes each. I’ve included all three videos in this section because I want every WWE fan to see them if you missed them. The reason this feud has been so amazing is because it feels real. Their interaction started eight years ago with The Miz as the “pro” for the “rookie” Daniel Bryan on NXT, even though Bryan started wrestling before The Miz (the Miz is one year older at 38, while Bryan is 37 years old). That was 2010, which led to some matches between them and Bryan eventually beating Miz for the US Title. As the years went by, each guy became a WWE Champion. From 2015 until this year’s WrestleMania, Bryan didn’t wrestle due to concussions. In 2016, the rivalry was back on again because of The Miz cutting an epic promo on Bryan after Bryan questioned the toughness of The Miz. Bryan walked away because he didn’t want to get fired and now, two years later, they can finally have that proper match together. Who wins? I don’t know, to be honest. It can go either way and I think we’ll get multiple matches out of this feud, which is great. It’s a difficult match to predict because I can see the positives for either man getting the win. For Bryan, he’s the face in the match, so it would be nice to see him win to shut up the heel Miz, who is one of the cockiest guys in WWE. They could do that with Miz attacking Bryan after the match or on Smackdown to keep the rivalry going, but that’s not what I would do. I’m going with Miz for the win perhaps with an assist from his wife Maryse, who could be seated in the front row or maybe at ringside. That could even lead to a mixed tag team match down the road with Bryan’s wife Brie Bella joining him. I’m just throwing it out there as a possibility. My official prediction is “Miz wins in cheap fashion.” I don’t know if that’s going to be pulling the tights, using Maryse to help, or something else, but I think it makes more sense for Miz to be the braggadocios heel that he is, leading to Bryan challenging him to a rematch at the next PPV. I think with Hell in a Cell as the next pay-per-view, it makes a lot of sense to do The Miz vs. Daniel Bryan again at that show as one of the Hell in a Cell matches. They could make that a number one contender’s match for a WWE Title match with Bryan getting his win back leading to a title match soon after. Long term, I would love to see Miz win the WWE Title later this year or early this year, then Bryan wins the Royal Rumble and it sets up a WrestleMania showdown with Bryan beating Miz for the WWE Title next year. This will be a lot of fun and I think the Brooklyn crowd will be into this match more than anything else on the card. They will be on fire for it. It’s inevitable that Ronda Rousey will become the Raw Women’s Champion in the very near future. It’s either going to happen at SummerSlam, where she’ll get a lot of mainstream attention since Brooklyn is part of New York City, or maybe at the women’s only Evolution pay-per-view in October, which happens in be in Long Island, NY. Do you think WWE likes all the media attention they get from being in the NY market? They sure do. It makes more sense to me to have Ronda walk into Evolution as the champion because it will give the show more credibility when you know that a Rousey title defense is likely going to be the main event. Rousey has looked impressive in her three televised matches so far and she’s wrestled more non-televised matches as well, but those were tag team matches. I think there’s a lot of pressure on her and Alexa Bliss to have a good match because of what Ronda has done so far. Bliss isn’t really known for having great matches, but they have likely practiced the match for several weeks now, so that will help them. I don’t think it needs to be a long match. I think Rousey will win in about eight minutes with the armbar and she’ll win her first Raw Women’s Title in WWE. The next day, WWE will put her on morning shows like the Today Show and she’ll garner mainstream press that nobody else in the company can really get. That’s part of the reason why she’s there. Here’s hoping there are no bats at ringside. As of Friday, AJ Styles has been WWE Champion for 281 days. It’s the longest major title reign in the history of Smackdown, surpassing the 280-day reign of John Bradshaw Layfield, who held the title from 2004 into 2005. There have been longer WWE Title reigns since then (John Cena for 380 days and CM Punk for 434 days), but it’s still impressive to see how long Styles has held the title. Could he hold it for another three months and make it to one year as WWE Champion? It’s possible, but I’m not predicting that because I think Samoa Joe will leave SummerSlam as the WWE Champion. Styles and Joe have a lot of history, going back to companies like Total Nonstop Action with Styles starting there in 2002 and Joe joining the company in 2005. Over the years, they were allies a many times, but they were opponents even more often. Most of the matches were great too. They are both older now (Styles is 41 years old and Joe is 39), but they are still producing quality matches on a consistent basis. Like the Bryan and Miz feud, they have mostly been kept apart from physical contact aside from when Joe attacked Styles from behind a few weeks ago. It’s one of the most highly anticipated matches on this card. The approach to the feud has been interesting because Joe has taken shots at Styles as a father, talking about how Styles isn’t home for his four kids. This past week on Smackdown, Joe also read a “letter” from a member of the WWE Universe that wants Joe to win the title so that Styles can spend more time with his family with the letter signed by “Wendy Styles,” the wife of AJ. (It would really be Wendy Jones since that is AJ’s real last name, but it’s pro wrestling after all!) Due to those mind games, I think the story will be that Styles is off his game, he’ll make some mistake late in the match, and maybe Wendy will be at ringside to support him. Joe could taunt her, AJ can become overprotective, and Joe can capitalize on that to win the WWE Title. As much as I like Styles as WWE Champion, I think the timing is right to put the gold on Joe. It would also make me happy to see Joe reach the top of WWE. Both men should have signed with WWE many years earlier, but I’m sure both are glad they are there now, and they are likely ecstatic about working together at SummerSlam. This should be an awesome match. Here we go again. Brock Lesnar vs. Roman Reigns one more time, and perhaps the last time, with Lesnar likely to leave WWE after this match due to his desire to fight Daniel Cormier in the UFC early next year. I thought Roman Reigns would beat Brock Lesnar for the WWE Championship at WrestleMania 31 in 2015, but it didn’t happen. I thought Reigns would beat Lesnar for the Universal Championship this year, but it didn’t happen. I thought Reigns would beat Lesnar for the Universal Championship at the Greatest Royal Rumble event this yea, but it didn’t happen. Am I going to pick Reigns to beat Lesnar again? Yep, I am. Ever since Lesnar dominated John Cena to win the WWE Title at SummerSlam 2014, the plan (as far as we know) was to have Roman Reigns beat Lesnar to become “The Guy” in WWE. It’s four years later and it still hasn’t happened because Vince McMahon, now in his 70s, is prone to changing his mind more than ever before. The crowd reaction will be interesting, because the fans in New Orleans at WrestleMania hated this match. They absolutely rejected it, yet if you watch Raw every week since then, you’ve seen the crowds supporting Reigns more as Lesnar talks about how he hates the WWE Universe. Does that mean the Brooklyn crowd will like Reigns? I doubt it. In fact, I think Reigns will be booed more than Lesnar is. I expect the match to be pretty good, but the crowd reaction will be so strong that the work they do in the ring won’t really matter because the crowd will be the story. This will probably be the end of Lesnar’s title reign. The way I would do it is Reigns finally beats Lesnar after hitting something like three Spears in a row. After the match is over, an exhausted Reigns will cradle the Universal Championship in his arms only for Mr. Monster in the Bank, Braun Strowman, to walk out with the Money in the Bank contract. Strowman cashes in, beats Reigns easily, and the fans are ecstatic at the visual of Strowman as the Universal Champion for the first time in his career. I think it will be a very good show for the most part, but it’s a challenge to keep a crowd engaged for six hours of content. I’ve been to four WrestleManias this decade and when shows are that long, it’s very hard to keep your enthusiasm up for that long. Some matches will probably elicit loud reactions from the crowd, like Bryan vs. Miz, Styles vs. Joe, Bliss vs. Rousey, and whenever Strowman is out there, but the crowd might be dead at other points in the show. 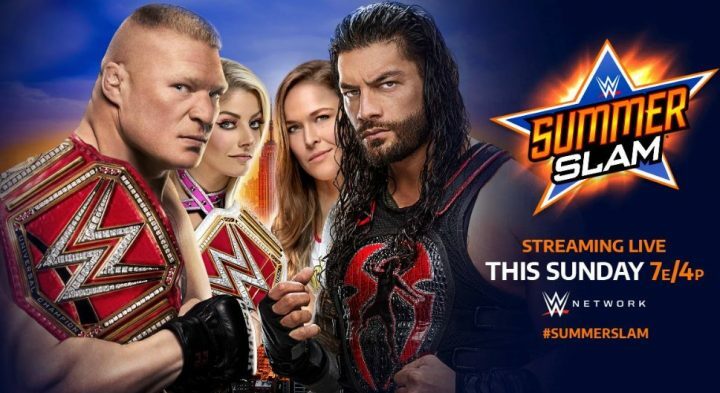 You can watch WWE SummerSlam this Sunday, August 19th at 7 p.m. ET/6 p.m. CT on WWE Network. There’s also a two-hour Kickoff Show starting at 5 p.m. ET/4 p.m. CT as well. If you miss it live, you can watch it on demand at your own convenience. I’ll be back on Monday for a review of the event.